Last month, X-ZELL CEO, Dr Sebastian Bhakdi, used his guest speaking spot at the 2018 HealthInvestor Asia Summit to reflect on the opportunities and challenges biotechnology start-ups face in Asia – revealing why so many of them fail to go all the way from ideation to product launch. Due to the overwhelming response to his presentation, the second episode of the new X-ZELL Blog features a complete transcript of Dr Bhakdi’s TED-style presentation (slightly edited and complete with relevant hyperlinks for online use). It is an amazing privilege to be here today at such a high-profile industry gathering. Thank you to HealthInvestor Asia for the invitation, and thank you to all of you for joining us here at the iconic Marina Bay Sands Centre. We’ve heard a lot about exciting new business opportunities in health care today, about fundraising and deal making, and about the challenges and opportunities that come with digitization. To strike a slightly different tone, I would now like to bring a different perspective to the mix – the one of an ambitious young start-up ready to take on the world. 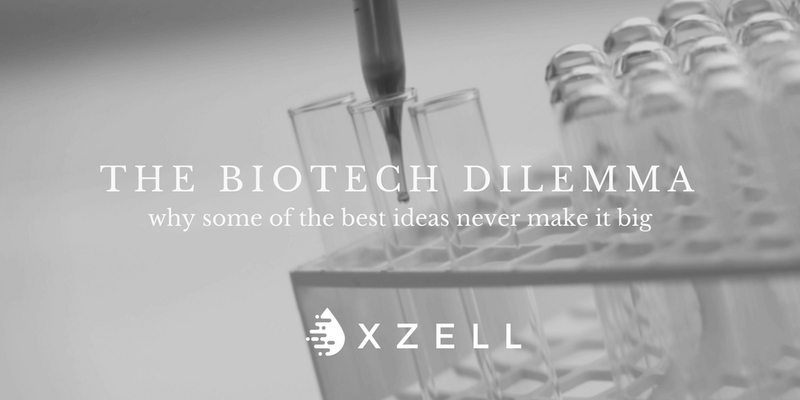 Our company, X-ZELL, is one of the first – if not the first – Silicon Valley-backed, biotechnology start-up in Asia, and it’s been a fascinating journey earning that title. If you consider that a few short years ago we were still a small university spin-off, being able to be here today to share our story in this beautiful place is an amazing milestone for my team and myself. I am especially glad we are meeting in Singapore today rather than on the other side of the planet – in Berlin for example, or in London, or San Francisco. Trust me, I’ve been there: I grew up in Germany. I studied in Germany. I worked in Germany, the US and couple of other countries. Recently, I’ve even had the chance to get an insider’s experience of the famous Bay Area and meet some of Silicon Valley’s most innovative entrepreneurs. They were truly impressive people, very sharp, very audacious – and very nice. But, over the past decade or so, Asia has become home to us. To my family and me, to our company, and to our team. The reason is simple: For a biotech start-up, Asia is the perfect package. We found patient access is amazing, and governments are becoming more and more supportive. Step by step, they are starting to understand that embracing start-ups and entrepreneurs will get this region ahead. On top of that, we also live in a regulatory environment that doesn’t delay going to market. Look at China: In only eight short years, it has overtaken the US in terms of CAR T-cell immunotherapies – both in the pipeline and in trials – and is now overtaking the world in terms of patients saved. All due to the regulatory situation. So all in all, when we talk Asia, we are talking less bureaucracy for bolder entrepreneurs – especially in biotech. Conversely, when we talk Singapore, we are talking more opportunities for businesses operating in Southeast Asia. A global finance, logistics, and research hub, it is actively changing the face of globalization. So to me, meeting here today means meeting in the perfect place to send out the perfect signal to the rest of the world. If you asked me what biotech should be all about, I would simply say it should improve people’s lives and make medicine more efficient. Every time we manage to do this, we win. But every time we fail, we lose. If you then asked me what’s holding back many businesses in our space, I’d reply that most of them have lost sight of these basic goals. I founded X-ZELL in 2009 as a cell separation company. Our proprietary technology allowed us to separate just about any kind of blood cells – including malaria-infected ones. That was a great starting point, but in 2014, I realized we had the potential to do more. I sensed that our technology could make a difference outside the research community. I wanted it to be used to make a difference in people’s lives. So I set myself a new goal – to reduce the number of deaths due to undetected cancer to zero by finding the cancer cells that spread into your blood before it’s too late. Today, it’s been just over two years that I first presented this bold new vision to over 500 of North America’s most prominent investors at Y Combinator’s Demo Day in Mountain View, California. Many of them didn’t want to believe what I was saying. But a few – most of them early Google and Dropbox employees – did. Put simply, that’s how we became Asia’s first Silicon Valley-backed biotech start-up. With money in the bank and a clear vision in mind, I went back to the lab bench and managed to adjust and expand our existing technology to find a new, ultra-rare type of circulating tumor cell – CEC, short for tumor-derived Circulating Endothelial Cell. I guess most of you haven’t heard about CEC before, even though some of the most amazing work on this topic was published right here in Singapore by Dr Min Han Tan of AStar. CEC are a bit like the God Particle of cancer detection. We’ve known for the longest time that they are somewhere out there, but it has been virtually impossible to routinely find them. Until we cracked the code. 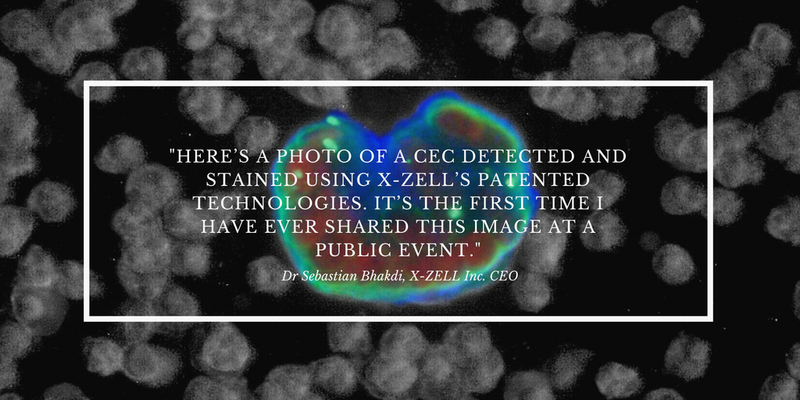 Here’s a photo of a CEC detected and stained using X-ZELL’s patented technologies. It’s the first time I have ever shared this image at a public event – so when you get home tonight, you can tell your family that you’ve witnessed something historical. As a physician, every time I see this image I get really excited. The cell comfortably sits on a standard laboratory slide, just waiting for its turn to be discovered under the microscope. It’s so simple – it just works. You might want to notice the brilliant spectrum of colours we use to characterize these rare cells. They reflect the highly complex antigen profile of CEC. This is something nobody else on this planet has been able to do to this extent in a routine setting. We’re not just telling you that something is wrong, we’re showing you what has the potential to kill you. Now, I won’t get too technical with you, but you need to know this: CEC are so powerful because come from the inner lining of the cancer’s own blood vessels. That’s very much unlike other circulating tumour cells, which have to come out from the deep insides of the tumour. CEC simply fall off the tumour’s blood vessel and end up right in your blood. Best of all, it’s clear to science now that any dangerous cancer growing larger than 1mm has to aggressively grow blood vessels to sustain its growth. As a result, CEC are the perfect biomarker for early cancer detection – if you are able to find them. And I’m happy to say – we can! We now had a product that would save people’s lives and make medicine more efficient. But soon we had to find out that nobody really wanted it. It turns out that researchers and practitioners don’t always speak the same language: After we managed to find CEC in prostate cancer patients – a feat never accomplished before – clinicians simply didn’t want to hear about it at all. It was a sad situation: We were detecting the undetectable and they simply couldn’t care less. Instead we realised that urology had an entirely different problem. Over a million times every day, PSA testing results in a really dangerous gamble for men’s health. In the worst case, doctors end up performing a multi-core biopsy of the prostate, which is painful for at least a week and notorious for its side effects. Even worse, in 75% of all cases it’s negative – meaning suffering through the whole procedure was entirely useless. So we are writing the year 2018 and we still don’t have any efficient way of finding prostate cancer, which leads to over 10,000 unnecessary, painful biopsies every day. We quickly realized here’s where X-ZELL can really help. Why? Because CEC boost the predictive value of PSA so that doctors don’t have to gamble any more. Our latest follow-up data shows that we can save over 50% of unnecessary biopsies. It turns out doctors do care about that. So today, I am happy to stand up here – in front of you – and announce that we are commencing our final validation study for X-ZELL Prostate™ right here at the National University Hospital of Singapore. Starting right now, we are collaborating with the President of the Singaporean Urology Association, Professor Edmund Chiong and his team to leverage the combined power of CEC detection and the world’s most advanced prostate tissue biopsy technique – the robotic super-saturation biopsy. Only very few medical centres in the world would have been able to make this happen, and we believe it’s pretty cool that Singapore is now ahead of them. What’s also cool is that additional tests for breast and ovarian cancers are in pilot trials in Thailand as we speak, because we will not stop at prostate cancer – there’s a lot more to come. So I can only repeat myself – Asia is a great place for biotechnology. Let’s recap for a second: Ironically, becoming Asia’s first Silicon Valley-backed biotech firm was the easy part. The tough part was to bridge the disconnect between research, clinical practice and the world of business. If you want to help people, any idea, any innovation, is only as good as the acceptance it gains in the marketplace. In biotech, that means if you want to improve patient’s life, you have to make sure your test actually reaches them. To achieve that, doctors – the true gatekeepers in our game – will have to prescribe your test. There is no other way. To make them prescribe anything, you have to understand the diagnostic problems they face at the patients’ bedside. In our case, that means understanding a complex mix of PSA gambling, over-diagnosis, over-treatment, as well as clinically significant and non-significant cancer. The solution we found, CEC after PSA, proved to be a winning formula. Patients win, doctors win, health care providers win. The physicians at the National University Hospital saw that immediately. So here we are – one step closer to achieving a word free of cancer deaths. Still, it’ll be a long way until we can realize our vision and get to the stage of mass cancer screening. The problem is not so much technology – it’s rather the need for a fundamental shift in attitude. I think we can all agree that once this happens, the business opportunity will be significant. I love this quote. Coming up with a cool vision or mission statement is the easy part. The difficult part is execution. This is where most people fail. This is why many ideas never really make it big. And this is why we have been building a team that can deliver. Take Johannes Hille. A personal friend of 11 years, he is one of the people who have helped X-ZELL get to where it is today. After 14 years of doing business in Asia – having created a multi-million-dollar sensor technology business here in Singapore – he came on board in 2017. First as one of our key investors, then as our Chief Operations Officer. His experience and business sense have since proven invaluable for X-ZELL – especially as we encountered some of the issues I’ve shared with you today. Johannes also helped us attract other world-class talent. He convinced Sebastian Grote, our Head of Marketing & Communications, to join us from Australia, and our Head of Engineering, Bart van der Voort, to come over from Belgium. So here we find ourselves today, at the centre of the world’s fastest growing cancer market, with a world-unique cancer detection technology being clinically trialled at one of the worlds best medical centres – and an international team ready to execute. Sometimes I still think I am hallucinating. But I am not – and neither are you. This is all happening right now! In fact, we are now in fundraising mode. 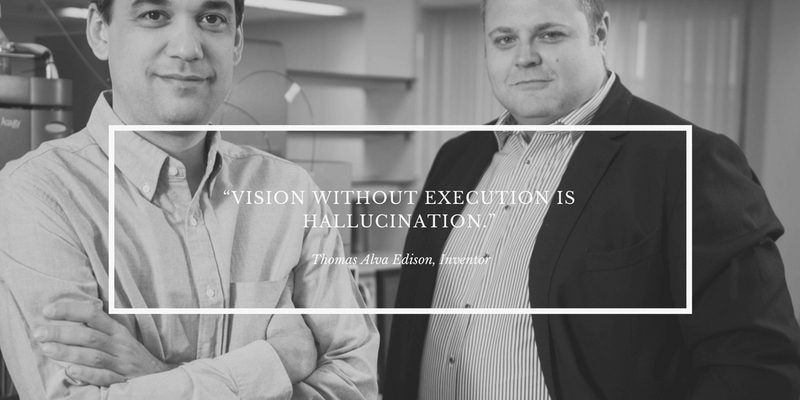 Because we know to make it big as a business, it’s not just about visions and execution, or about understanding clinical practice and the marketplace. But it is also about having good investors by our side who deeply understand the game of biotech who want to grow with us.